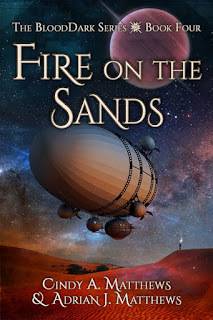 Fire on the Sands - out now! Fire on the Sands ~ A new BloodDark book is out now! Airship Captain Adena Nightingale takes on a smuggling run to the City of Night—and gets more than she bargained for! She rescues Earthman Greg Cole from the frigid desert of BloodDark World’s night side, but Greg in turn wants to rescue his friend, held somewhere in the City of Night. They reach the City, and all hell breaks loose when Adena and Greg find themselves caught up in the deadly aftershocks of an ancient war. Buy it here at Devine Destinies Books!